... pumping is a wonderful use for alternative power technology. Agriculture Solar™ well pumping is the use of sunlight to power well pumps, while the sun is shining. Agriculture Solar™ has simple solar well pumping systems that are powered by solar electricity and many times do not need to incorporate batteries for storing the excess electricity. We have easy to size and install Agriculture Solar™ water pumping kits to make it easy for you to determine which Agriculture Solar™ water pump system you need. We take the guess work out of solar water pumping. 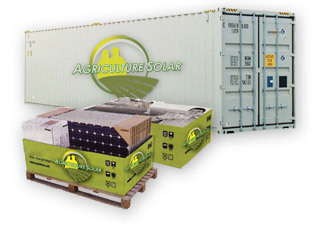 Note: alternative Agriculture Solar™ well option does not need batteries or inverters, however requires a brush motor pump with shorter life-expectancy of only 5 years. Batteries are not always necessary in remote water pumping situations, as long as your Agriculture Solar™ system is sized properly and you have enough water flow from the water source. The reliability and economy of Agriculture Solar™ electric power makes it an excellent choice for powering remote water well pumping. Farmers and ranchers all over the world are enthusiastic Agriculture Solar™ pump users. Their water sources are often spread over many miles of land where utility power is not accessible and where refueling and maintenance costs are high for generator use. Please call 520-369-AGRI or email if you would like solar well pump kit pricing or a more detailed analysis of costs for your particular application.